We can never thank you enough for the wonderful messages you sent for us to broadcast on Free North Korea Radio to North Korea this month for the Seollal (Korean New Year) holiday which started on February 16th this year. This program has become increasingly popular in North Korea, but also increasingly important in communicating the truth to the people of North Korea: that Americans care deeply for them and are not the “Yankee Imperialist wolves” who occupy South Korea and not the source of their suffering. These Seollal messages reveal the truth through your words, and we are pleased to report back to you the responses from both the staff of Free North Korea Radio but also people in North Korea who responded. We also got very favorable feedback from South Koreans who heard about the program. Free North Korea Radio began airing the Seollal messages from Members of Congress beginning February 15th through their daily Short Wave broadcast to North Korea, SNS (social network service), and on the internet at their Free North Korea Radio Website www.fnkradio.com. DesJarlais of Tennessee began airing starting February 15th. began airing starting on February 16. The staff of FNKR also sent their thanks to all the Members of Congress for participating in the Seollal broadcast and said they looked forward to hearing more heartfelt messages from US politicians for the coming holidays. 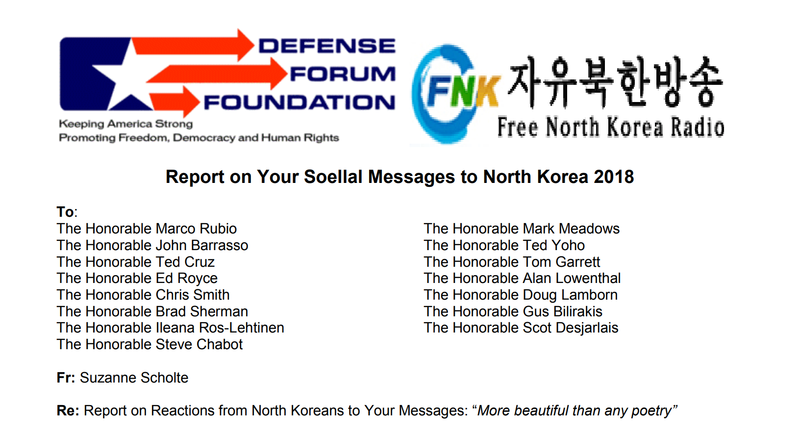 ALL messages that were broadcast to North Korea can be seen at www.defenseforumfoundation.org. For more information contact DFF at 703-534-4313 or email.